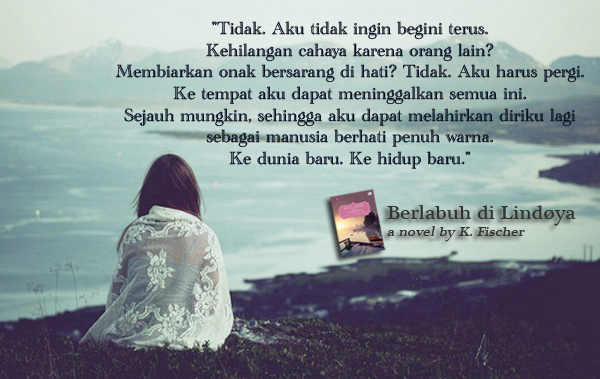 blog tour "Berlabuh di Lindoeya"
There is always a first time for everything. 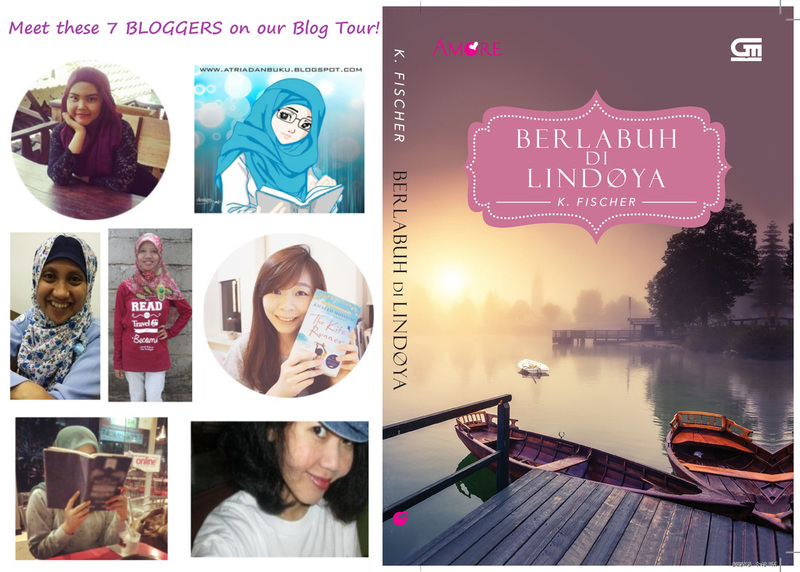 With help from 7 bloggers, sponsored by Gramedia Pustaka Utama ﻿﻿, I was able to make my first Blog Tour. Okay, now let's start from the beginning. For somebody who do not really know what Blog Tour is (like me), a Blog Tour is a modern way of a “Book Tour”. The traditional way, where the writer visits some book stores for reading, book signing, greeting & meeting his/her fans, step by step is being revamped to be more efficient in our hectic life. The process is similar, but the book stores are replaced with blogs. No more visiting book stores, nowadays the writer visits blogs. No traffic jam, no long administration (and negotiation) process with book stores’ owners, no hassle among fans (or another way around, no empty desk for writer without fans). Even though I did a crash program to find them, I am lucky that these 7 ladies are really professional. All of them are famous book bloggers and some were hosts for many blog tours. You can imagine how their advices were really useful for me as a newbie. The next challenge I had was to make a schedule. So, who would begin and who would end? Sulis Peri Hutan volunteered to open. The remaining bloggers suited themselves to the time table harmoniously. The cities where they lived was also important because we wanted to have them spread out as much as possible. Then came the question, when will the blog tour begin. First thing first, I did not want to put anyone in stress. 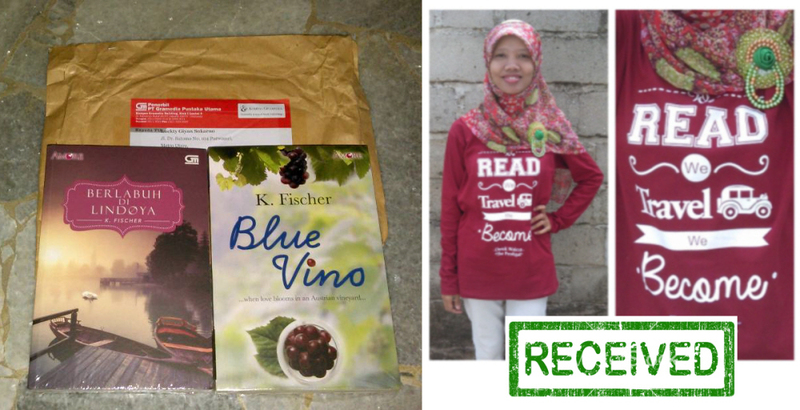 I wanted Gramedia (our sponsor) to have enough time to send all books to all bloggers, especially when we all know that book shipment (or any kind of shipment) in Indonesia can be challenging. I also wanted, all bloggers be able to read my book at their own pace. No rush, no stress, it should be a happy 7 weeks journey for all. Because most of them lived outside of Jakarta, and some not even on Java Island, I put one full month as a preparing, shipping, reading, reviewing, getting to know each other as a team, promoting time. Including the time for me to check if everybody already received THE book. Then it was time to make the final schedule. We wanted to develop a varied and interesting program. Each blogger input their own unique ideas that lead to a great program. The result is 7 weeks full giveaways and fun actions to bring the relation among writer-bloggers-readers closer than ever. WEEK 1. 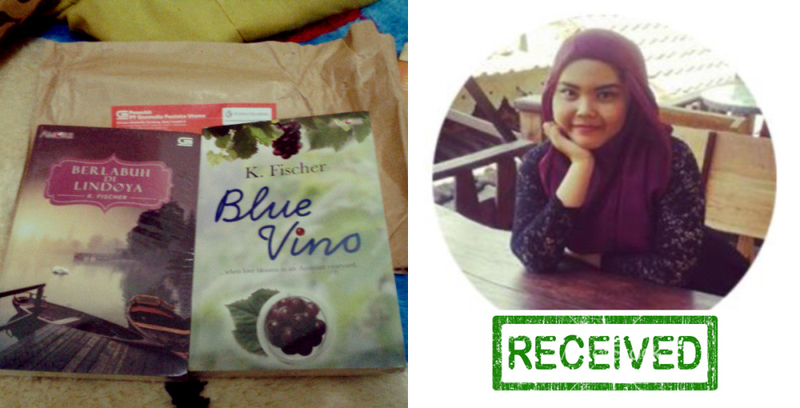 21 - 27 September - http://www.kubikelromance.com/2015/09/berlabuh-di-lindya-by-k-fischer-blog.html - Sulis Peri Hutan, with the giveaway question: "where is your most romantic place?" Venice. The city is surrounded by canals and connected by bridges. The first time I saw this city was in the film “The Tourist”, starring Angelina Jolie and Johny Deep. Just imagine how romantic a dinner there would be, together at one of their restaurants on the edge of the canal, accompanied by the sights of the city lights. Or, even more romantic, under the flickering lights, sailing around that beautiful city of Venice with gondola. Only you and your spouse in a gondola* consider the gondola’s carrier was not there * Thank you Sulis. If I was Sam, I will escape to Alaska, one of the states in the United States. With snow white climate, for sure this would be the right place to eliminate the dark past. And in certain months, alone, enjoying Aurora Borealis phenomenon will be too interesting to pass by the wounded soul. Highlight of the Week was Twitter Chat (LiveInterview) tree hours nonstop. The winner was : Afika Yulia. Trivia: After two hours of nonstop twittering, our blogger's smartphone crashed, because it overloaded. More than 200 entries were entering her twitter in the same time continuously and simultaneously. After our "LiveInterview" time was over, we found out that we were twittering without blogger. WEEK 3. 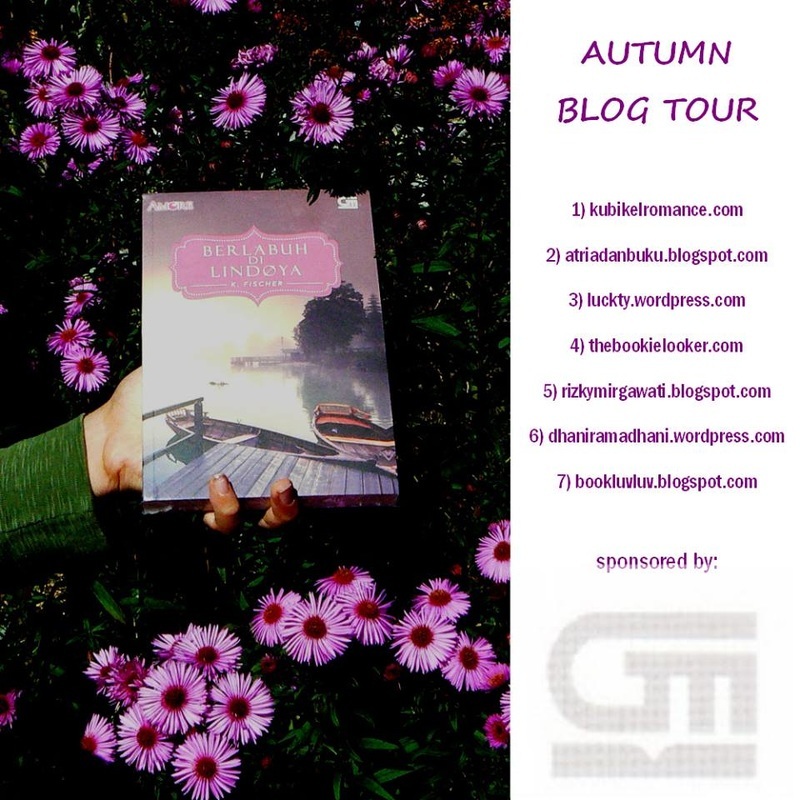 5 - 11 October - https://luckty.wordpress.com/2015/10/04/blogtour-review-berlabuh-di-lindoya-giveaway/ - Luckty Giyan Sukarno. with the giveaway questions: "If you are destined to live in the North Pole, what would you do? Give reasons." Living in the North Pole? I will be cold for sure, especially when I compare it with staying at Purwakarta. It's good that I wasn't born in the North Pole (which I still cannot imagine). But if I were destined to move from Purwakarta to the North Pole, maybe I could eat fish every day. Do they have catfish there? WEEK 4. 12 - 18 October - http://www.thebookielooker.com/2015/10/blog-tour-book-review-berlabuh-di.html - Stefanie Sugia, with the giveaway question: "What would you think about living on a deserted island like Lindøya?" 1. Fabrics and other materials and equipment to make clothes. This is only if I can not return to my old normal life and shop in the stores for what I need. 2. Staples of crops, vegetables and fruits, which are fresh and healthy and continue to regrow, as food supplies. 3. A clean and simple house to live in. 5. Although it may be a long journey, I would occasionally like to visit people I love who live in distant places. But this is only, if they do not live with me (I am alone on that island). WEEK 5. 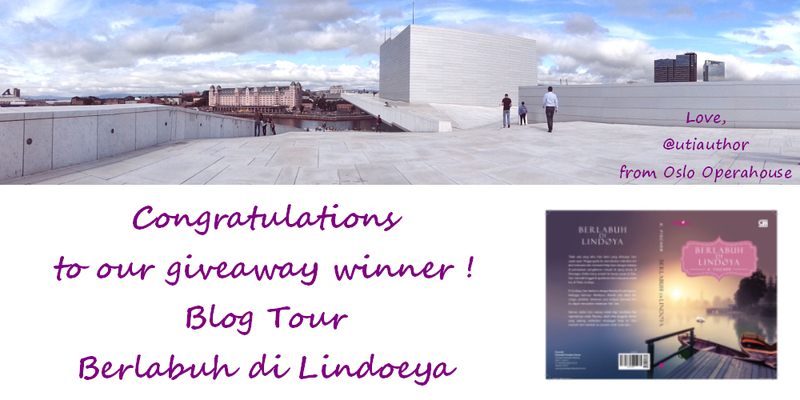 19 - 25 October - http://rizkymirgawati.blogspot.co.at/2015/10/blog-tour-berlabuh-di-lindoya-giveaway.html - Rizky Mirgawati. She gave NO question for giveaway and also no highlight of the week, but she made PhotoQuotes Contest. 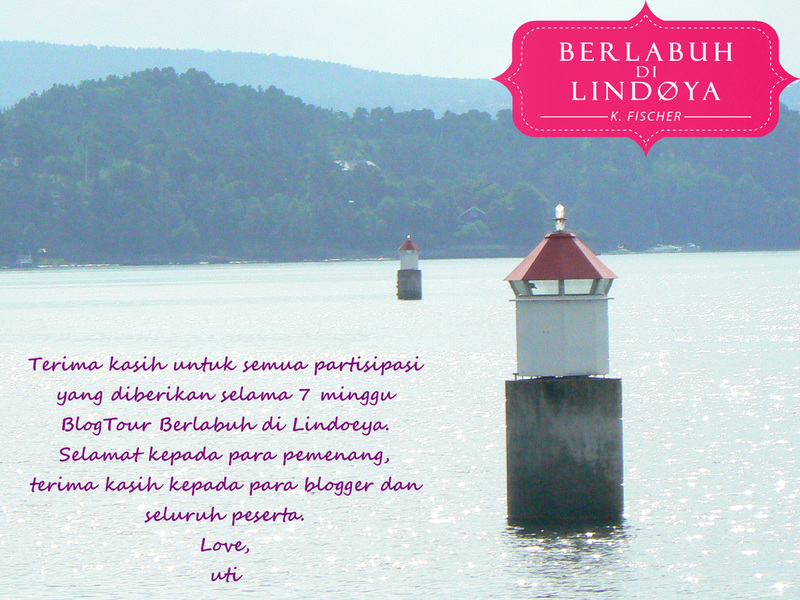 Yes, all contestants must make PhotoQuotes from novel “Berlabuh di Lindoya”. After longgggg discussion, the blogger and I decided to make four people as the winners. We thought the rule to have only one winner did not justify the creativity of our fans. 1. 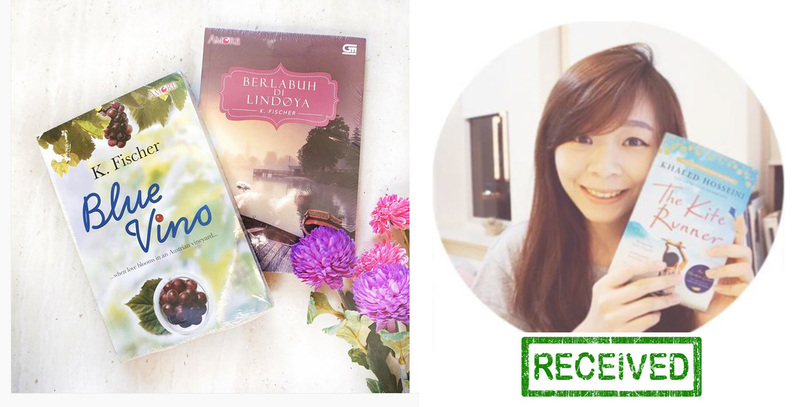 Putri Prama Ananta - chosen by blogger. 2. Aya Murning - chosen by me. 3. Tri Indah Permatasari , and 4. Anggita Dewi Ravina, as the most industrious participants, because each of them sent us 16 Photoquotes! 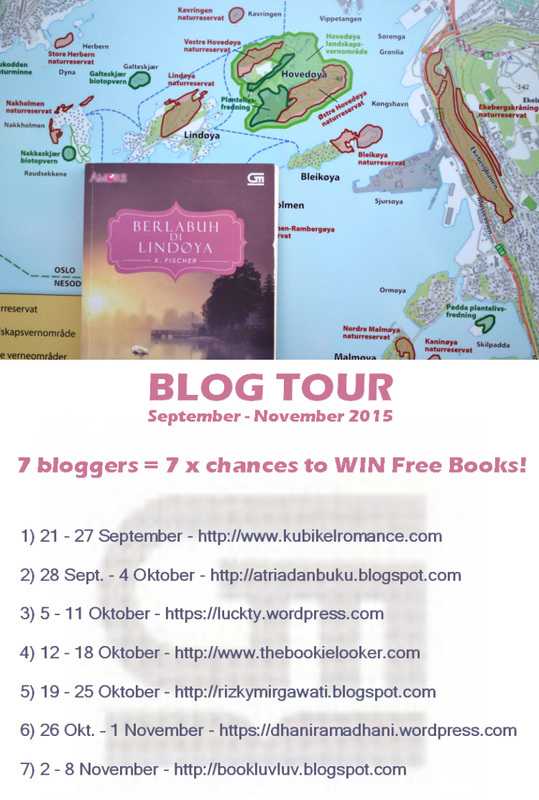 https://dhaniramadhani.wordpress.com/2015/10/25/blogtour-giveaway-berlabuh-di-lindoya/ - by Dhani Ramadhani. She twisted the rules of the game. It was not her who gave questions, but each participant must give five questions to her and me. The most creative question won. The winner was: Febrina Adriani. 1. How do you think outside the box while looking for a new story idea for writing? 2. 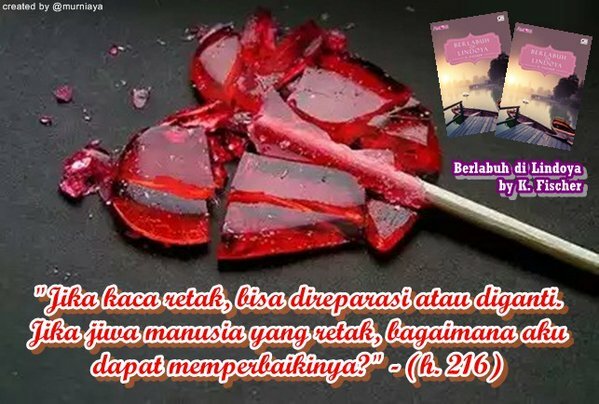 What will be your reaction if there is people who said that your story similar to another novel, which you do not even know exist? 3. Do you think a high school student (14 years old / first class) like me is too late to be a cool blogger or a great author? 5, Finally, this is an obstacle that often happened to me. Boredom to write the beginning of the story, I think I want to write straight to the top of the climax. So, did you ever felt this way? If yes, how did you solve it? WEEK 7. 2 - 8 November. 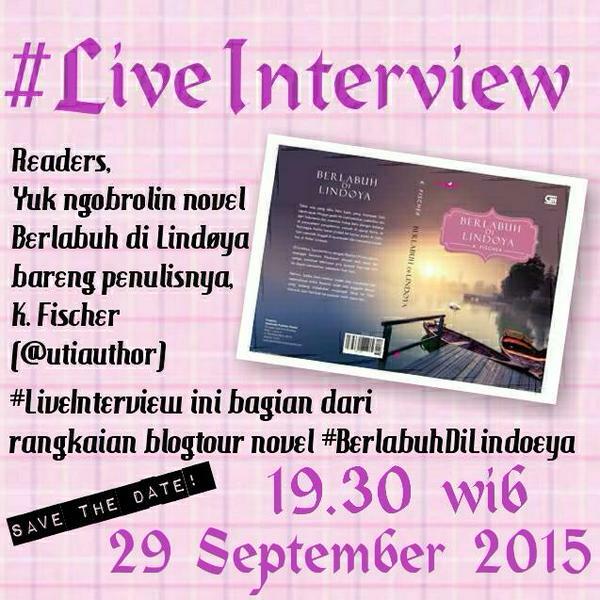 http://bookluvluv.blogspot.co.at/2015/10/blogtour-giveaway-berlabuh-di-lindoya.html - Fransisca Susanti. She gave NO giveaway question but TwitterChat. Participant who asked the most interesting question won. Plus one extra winner, because this week is our final week: Aanisa Natasya. Trivia: After two hours of nonstop twittering, Twitter Inc. blocked our blogger's twitter account, because she retweeted too much. More than 200 entries were entering her twitter in the same time continuously and simultaneously. We must wait for some hours until she allowed to use her account again, so she could announce the winners.